1-4PM Sunday May 21st, June 4th, June 25th and 1 hour prior to auction. 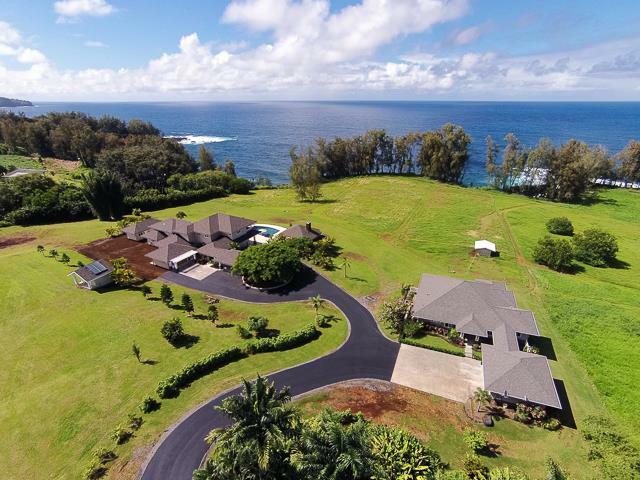 Unique island lifestyle on the Hamakua Coast at Pepeekeo Point with this fabulous luxury oceanfront estate. Virtually hidden at the end of a private road, the 9 useable acre (4.15ac fee simple) gated estate greets you with swaying palm trees, rolling horse pasture and gorgeous ocean views. Every attention to detail was given to this impeccably-designed home. Custom crafted built-ins, finishes and mill work. Collaborated by Barclay Butera Interiors of Los Angeles and New York, the easy flow and open floor plan of the dining and living boast a spectacular view between indoors and outdoors. Custom furnishings from Baker, McGuires, Guy Chaddock and Hickory Chair. The kitchen's impressive Italian Calcutta Gold island is a chef's dream and wonderful for entertaining. Home theater and game room are ideal for large gatherings or intimate screenings. Below the home theater is a wine tasting room and 1,000 bottle wine cellar lined with imported French Beaumaniere stone walls and floor. Lanai and pool deck areas tiled in Caribbean coral stone, five-star resort pool with 360 degree wet edge perimeter with underwater speakers, dark interior and 40' vanishing edge. Independent spa and expansive fire pit. Cabana includes large stone fireplace, grilling station, bar and full bath. Home has programmable smart-home technology; the "Savant" whole home system allows homeowners to easily control your lights, climate, music and security system from anywhere in the world using any iOS or Android device. In addition to main home (built in 2015), there is a second home. Main home consists of 6,741+/- livable SF and 2,310+/- other SF. Guest home consists of 2,104+/- livable SF and 1,296+/- other SF. 8 bedrooms, 7 full and one 1/2 baths. This is island living at its finest and an opportunity that may never come again to the East side of the Big Island. HOA dues $650/year. Airbnb historical rates of $2500-$10k/night (depending on time of year) with 7 day minimum plus $700 cleaning fee. This individual seller chose to auction their property for a time-definite sale. If you have a property to sell, please contact Customer Service at 800.801.8003. A Buyer's Premium (Buyer's Fee in WI) of 5% ($10,000 minimum) will be added to the high bid and included in the total purchase price. • Association Disclosure. Buyer acknowledges and understands that property is bound by the assessments and restrictions of a Homeowners Association, and Buyer agrees to be bound by same. Buyer agrees to assume any special assessments that may be payable in installments that are not yet due. Dues are approximately $650.00 per year and are subject to change. Buyer acknowledges receipt of Homeowners Association information packet including Rules and Regulations and By-Laws. • Personal Property Disclosure. Property is being sold with personal property present, and the removal or retention of the personal property remaining on site at the time of closing will become the responsibility of the Buyer. • Water Source and Well Potability Disclosure. The water source for this property is a well(s) located on the property. Regarding any assertions as to the condition or potability of the well(s) reported to be on this Property, please see Seller's Property Disclosure. Buyer is purchasing the Property as-is, where-is. • Propane Disclosure. Neither Seller, Williams & Williams, nor its agents make any assertions or guarantees as to the condition of the propane tank or location of lines that may be located on the property herein. Buyer is purchasing the Property as-is, where-is, and is responsible for all costs for any required remediation thereto. In the event the propane tank is leased, the Buyer is responsible for any and all costs/remediation required for the propane tank, assuming all lease terms, and/or negotiating a new lease agreement for use of any propane tank.